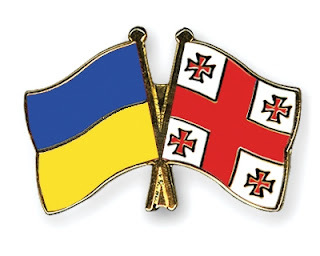 There can be found a lot of materials about historical-religious and cultural relations between Georgians and Ukrainians that can shed light on a whole number of issues of coexistence of these two nations. Namely political and religious factors have played the greatest part in mutual interest that Georgia and Kiev Russia took in each other - Great state union of Eastern Slaves was the cradle of the Ukraine, Russia and Belorussia. As it is historically known in the 4th century Christianity was declared as a state religion in Georgia and orthodox Georgian public men played great role in the world of early medieval Christianity. As a Christian state Kiev Russia was formed in the 10th century and represented one of the biggest orthodox Christian countries. According to the historical sources, introduction of the Georgian and Ukrainian nations happened at the beginning of the 10-11th cc. By this time were formed relations and connections between Kiev mid Georgia who both were the countries on high level of cultural and economical development and also with other countries. In the mentioned period Georgian artists took part in painting of the famous cave "Kiev Pechora" monastery. This monastery as it is known was built like the monastery of Georgians on the Mount Athos which for a long time was an example to follow both for Russa and Kiev. In the second half of 11th century Anthon Pechorski (985-1073) travelled two times to the Mount Athos and brought to his motherland the "Image of Athos". Collection of the life description of the monks of Kiev caves preserved information that speaks about the building of the main temple of the monastery and it says that among the invited builders were Georgians too. In particular, Georgian masters brought materials for mosaic and decorated the altar, walls and the floor of the temple with mosaic ("Musia"). Popularity of Georgian builders and masters was great outside Georgia and that is why, they were invited to Kiev to decorate this oldest monument of Christianity. According to Kiev historical annuals, there was migration between Georgia and Kiev Russia in the 12th century. It was so important that Velikiy Kniaz (Grand Prince) of Kiev Iziaslav II second wife was daughter of Demetre I, who was the son of famous Georgian King, David IV ‘The Builder’. There is no doubt that at that time Georgians knew about the existence of Kiev Russia and in the first place they were informed about its power and their orthodox Christianity. This last circumstance was of great importance. The religion drove different states and nations closer culturally and made it easy to establish kinship among them. Historical and religious relations of the definite period between Georgians and Ukrainians were ended by the appearance of Mongol Horde on the horizon of the cultural nations. This further was followed by Osman-Turk and other invaders aggression and thus Georgian-Ukrainian relations were stopped for quite a long period of time. However prominent pages of religious relations were preserved forever in the history of these two nations. 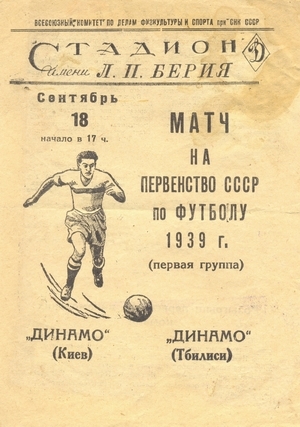 V-th USSR Football Championship. 20-th round. 18 September 1939. Tbilisi. Dynamo stadium by .L.P.Beriya. 35,000 spectators. Dinamo (Tbilisi) vs. Dynamo (Kiev) 2:2 (1:1). Scorers: 1:0 Harbediya (15), 1:1 Komarov (20), 2:1 Paichadze (57), 2:2 Komarov (78).